Temporary Tattoos that will make your event a big hit! Many forms of entertainment are at a showcase in a birthday. But a few are really memorable. A tattoo artist is one of them. What makes a tattoo artist so desirable is the versatility of designs and easy removability. Many people are scared of the permanent tattoos. 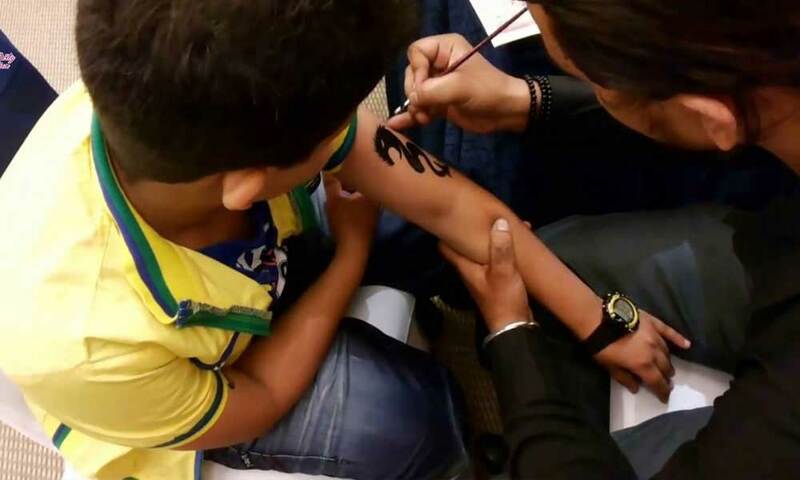 Whatever your reason, these temporary tattoo artists are here to put a whimsical butterfly on your child’s shoulder, give you that tough-cookie "Mom" tat on your bicep or a superman tattoo for your son. Our trained artists offer a variety of services for your guests to get “inked.” Our professional artists have 100s of tattoo choices and create a detailed temporary tattoo in just a few minutes, which ensures your guests aren’t waiting in line or spending their evening in the tattoo parlor. Plenty of temporary tattoo styles are available from baseball, basketball, football, soccer, dance, crowns, anchors, flowers, cheerleading to any other theme that you can think of. These temporary tattoos are really fun and will last a week or less, and most come off simply with alcohol. We offer a choice of non-toxic ink colors that are clean with no mess. These fun temporary tattoos take only minutes to apply and will be the hit of your event and create great, fun photographs. There are so many tattoos to choose from. So, what are you waiting for? Hire one now! We suggest that you find a temporary tattoo artist who is skilled in your specific event area. For example, if you're hiring a temporary tattoo artist to do your child's birthday party, be sure the artist has child appropriate stencils and designs. You should also be sure to choose an artist that has a style you like. You can determine this by asking them for pictures of their previous body art and designs. Lastly, you should talk about specifics with the artist. We will provide you the best ones at the best price! We at Birthday at Call has become the epitome of great events and satisfied customers. We provide the best tattoo artist in Delhi for your entertainment. We have years of experience in this field and pride on having long lasting relationships with our customers. Let us serve you with our dedicated team of experienced managers and assistants.